Delighted to see he is getting better in the next post. 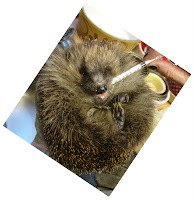 Does the picture give a clue as to the best way to syringe-feed a hoggie - on his back? Not the best picture I now realise as in fact it is always best to hold a hedgehog in the most upright position possible. This prevents any liquid from being breathed in by accident. This is particularly important with baby hedgehogs that can develop inhalation pneumonia by inadvertently breathing in fluid which then reaches their lungs. With Roger this was only the position that worked, though I tried to hold him more on one side whenever possible. I might change the photo as it could be sending out the wrong message re syringe feeding. Thanks for pointing it out.